Anybody know a trick how to identify which brake combo valve I have? An 86-89 4-wheel disc brake line kit screws into all the fittings so I'm guessing that rules out the possibility of a gen 2 design. Last edited by QwkTrip; 02-06-2019 at 12:57 AM. Still hoping to become more enlightened about this before I do anything with this combination valve. Here's the back story. Years ago I bought a used four-wheel disc combination valve. Problem is that I don't know how to confirm what it really is. 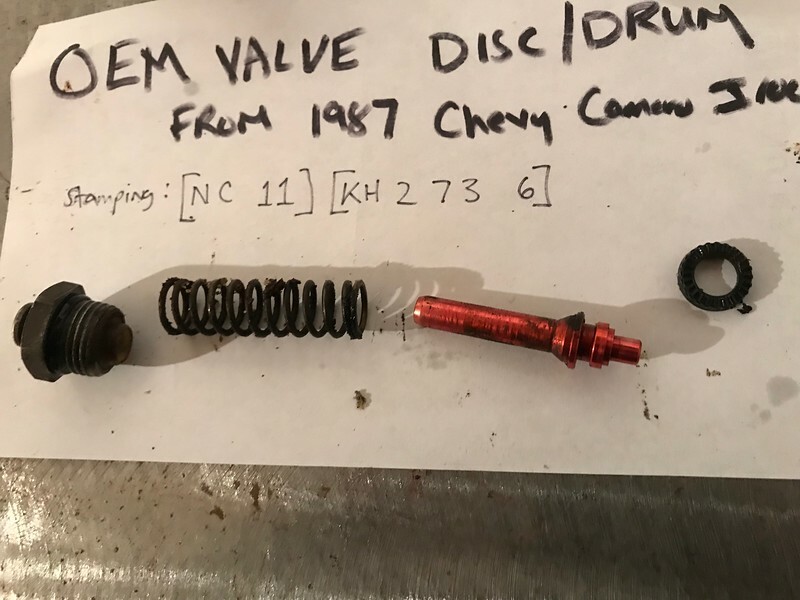 I'm fairly confident I have a pre-'89 combo valve. But I'm still not sure how to tell the difference between drum vs. disc. But maybe that doesn't really matter. The end game here is to convert this sucker to 1LE specs. I'm not sure what are the differences and hardware I need to do that. If it is just a matter of changing spring rate for rear line then I know how to do that. But I suspect the 1LE might be more than just a spring rate change. Anybody have knowledge of this? Been having an offline conversation with Drew who is always helpful and full of knowledge. 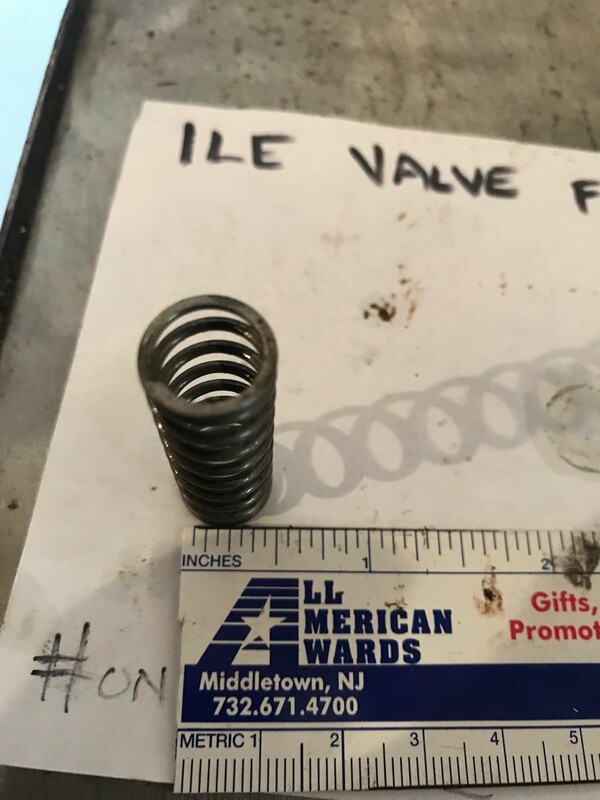 Seems the first 2 letters in the code signify what kind of valve it is. NB might be from an '87 IROC with four-wheel discs using the Delco-Moraine iron calipers. Now the question is whether there is any difference between the Gen 1 design and the later 1LE Gen 2 design, other than tube nut sizes, and perhaps the rear valve spring. I wrote back to you on my prop-valve thread, but just in case you didn't see it..
.. I can take detailed photos of the prop valve assembly in the aftermarket Ed Miller 1LE prop valve setup I have had in my car..
...AND I can take photos of the disc/drum prop valve (and its internals) that was on my car when it left the factory in 1987. This is kind of humorous because we've got two threads with ideas going in opposite directions and we're helping each other through the questions. I'm giving some thought to going where you've been and you're giving thought of going where I've been. Maybe that means we should both just get different brakes! Last edited by QwkTrip; 02-16-2019 at 10:59 PM. That link is a pot of gold, man! yeah it is! always seen it, but never really paid much attention to it until recently. ok, so here is what I found. let me know if you need more photos or info. excuse the dirt and crud on the old prop valve, it has been in opren storage on my parts shelf for about 9 years. I did notice that the external size of the nut/head is smaller on the drum one. it take a 3/4" socket, where as the 1LE one took a 13/16" socket. the thread size and pitch is exactly the same though so either one can be installed into a GM prop valve housing (good for my dilemma). Obviously the spring and plunger are different and i think that is what you wanted to see. I also wrote down the stampings on both housings, as best as I could read them. The plungers only fit into each respective end nut, one is larger than the other in diameter. and maybe its just the discoloration, but are both nuts made of aluminum? I would assume they both are, but would it make sense that the 1le is brass? color looks a bit off. 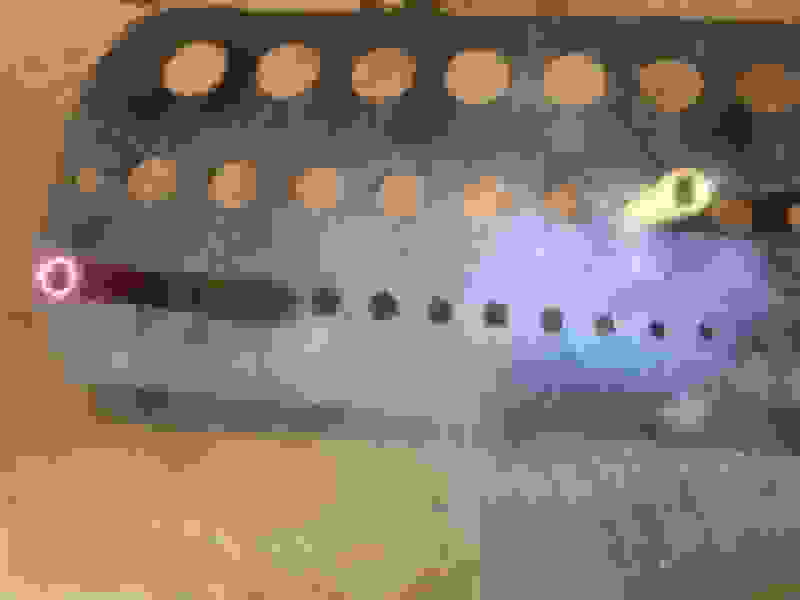 Last edited by IROCZman15; 02-17-2019 at 07:16 PM. Ha ha. love the Craftsman -vs- Taiwanese stuff in order to help your comparison. Seems like the spring is well known. What is not, is the valve body itself. What are the diameters of the inner channels/tubing if you will that make up each of these. Is it really just a spring that differentiates them? It's starting to make sense why people get such variance in brake performance when they swap to the same spring. Looks like the drum and disc piston have different length to spring seat, so the compressed spring force will be different when installing the same spring in both. The disc piston will produce more initial spring force at the seat. Last edited by QwkTrip; 02-17-2019 at 10:26 PM. Looks to me like the Flynbye valve internals are aftermarket. The stock parts are red anodized aluminum same as the drum style. The end cap would be bare steel on an original too. The Flynbye parts look like machined brass instead of steel and aluminum. I'd say ask Ed, but he hasn't been around in a loooooong time. yea. I can measure for you, but unfortunately I do not have a digital mic or anything past a simple tape measure and a $5 hand caliper. I'll do my best. Last edited by IROCZman15; 02-17-2019 at 11:30 PM. Drew - I'm pretty sure my valve is stock (it's dirty enough inside to be) and the plunger is just plain aluminum. The valve bodies also have little lines on them. one is straight other diagonal. forget which is drum, which is disk. MD = 89 J65 w/ 1.5 mm 2nd design - this one throws on (EXC (Y82) ,1LE, but not sure how to interpret what it is trying to indicate because of the EXC but it appears this would be the bigger front brakes. Y82 is TTA and they also got the big front brakes. 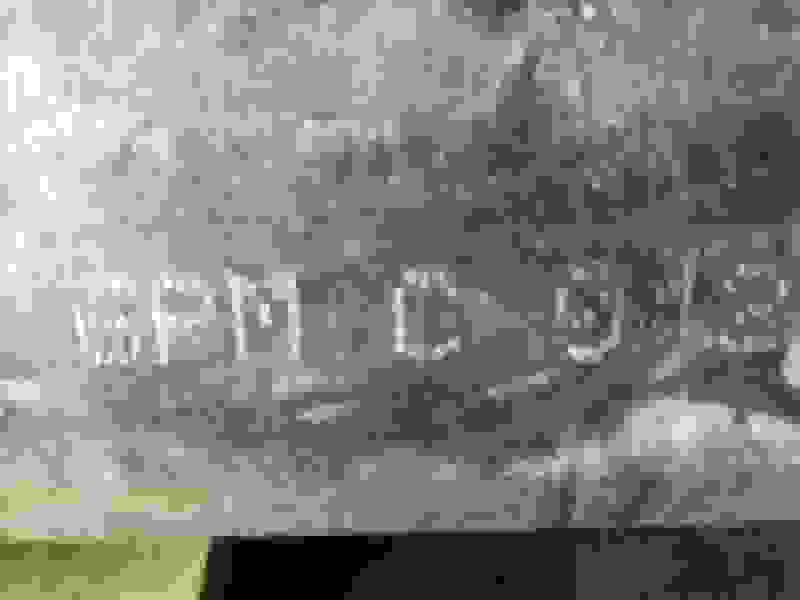 What marks are received in 1990-1992 it does not say. I think the master cylinder was a difference design in those years and same for all setups, but havent heard/read on the combo valve. Also, from 82-85, there is no broadcast code mentioned, maybe a different year book will provide that answer. Last edited by LiquidBlue; 02-18-2019 at 09:55 AM. The early cars have a completely different style combo valve, not the extruded aluminum style with broadcast codes. 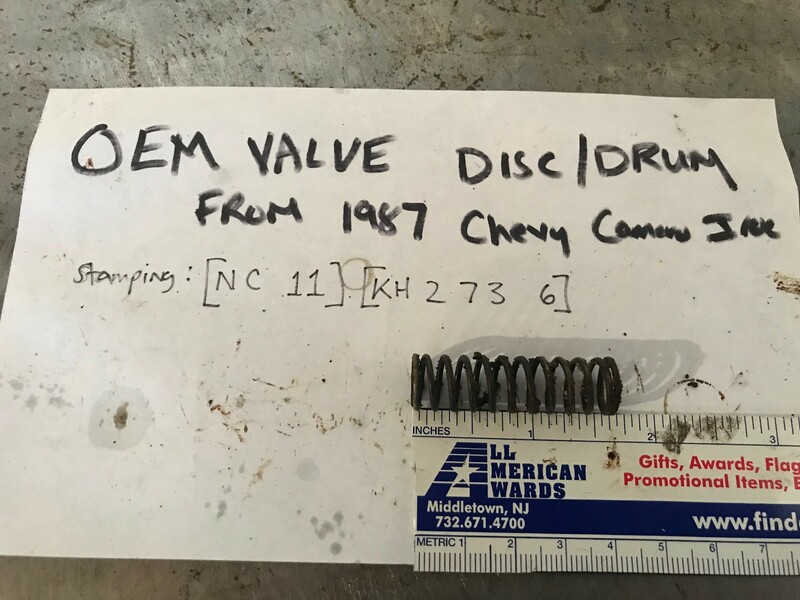 The 1st design 89 valve is differentiated from the 88 because the book is trying to point out that there are two designs in 89 without confusing the definitions for earlier years. Just an educated guess, the EXC (Y82) ,1LE is probably because the brake balance of the 1LE brakes was altered. Early 1LEs supposedly had issues with the rear brakes locking too soon, so the balance was shifted to prevent that from occurring. The TTA may well have used the standard J65 combo valve because GM was trying to avoid the braking issue. 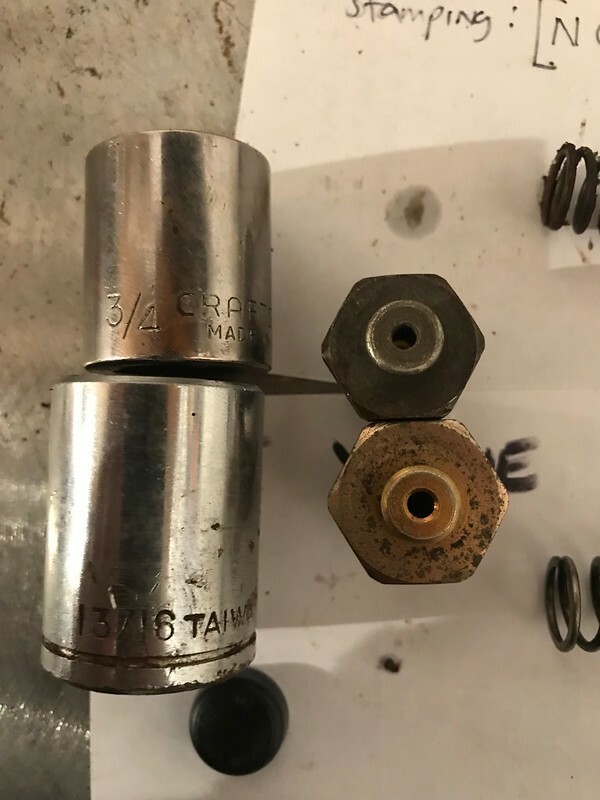 The master cylinders on 89-92 cars are the same drum vs 4whl disc. Before 89 the disc cars had a specific master cylinder. The pistons on the PBR calipers are smaller than the Delco-Moron calipers, so the fluid needs were different. 90-92 drum cars used an MB combo valve. 90-92 Disc cars used a MC, MD, or LF. Here is a later P&I illustration. I used a basic ruler and verified it with a hand caliper to measure the springs today real quick. heres what I found. My measurements are not exact . sorry. If you need more info, let me know. I will be out in the garage all day tomorrow installing my brand new Moser 12 bolt that arrived today. Do you have the wire diameters too? I'm going to use all this to calculate the spring rates. 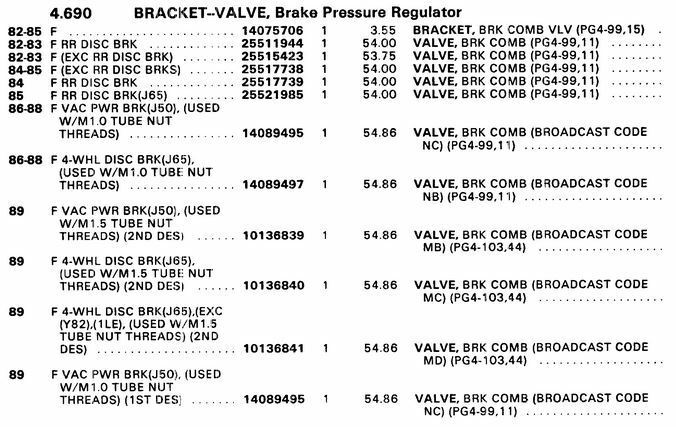 Well see, LF isn't listed in the book, but if you look at a 90-92 PBR valve, the originals are marked LF. You can also see the LF tag on low mileage cars in pics. It's hard to say why the book doesn't list the LF. 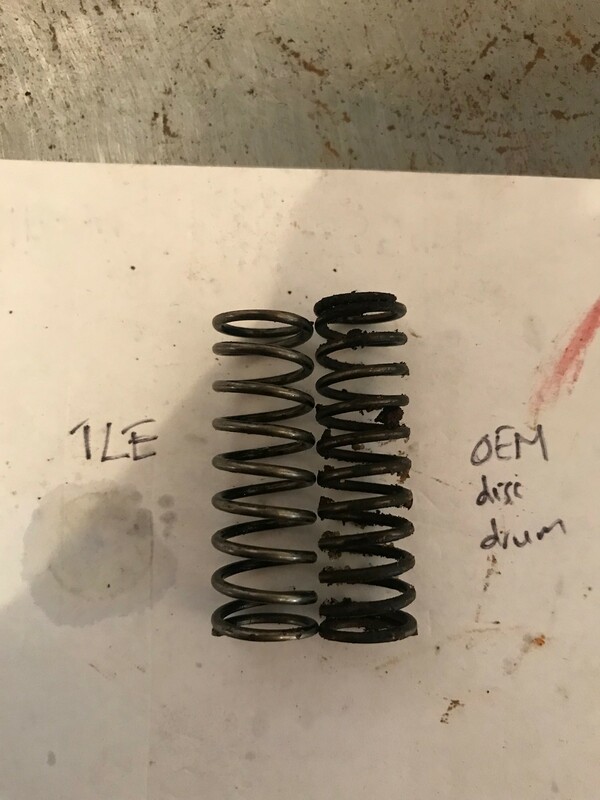 In the pictures it sure looks like the drum spring has 11.x total coils, not 10.x. And the 1LE spring is 9.x total coils, not 8.x. Do you agree with that? I really suspect your 1LE is the same exact spring I have with 9.625 coils. If you hold the coil in front of you looking on end, and put the far end at 12:00 position (high noon), is the end closest to you really at the 6:00 position or more like 8:00 position? Assuming both coils use 0.055 inch wire, the "NC" drum brake spring has 24.6 lb/inch spring rate, versus the "NB" disc spring at 19.56 lb/inch. But if you installed the drum brake spring in a disc unit then it would act like an even heavier spring because it would be compressed much more when assembled than it is in the drum unit. Last edited by QwkTrip; 02-19-2019 at 12:53 AM. Based on the scale of parts in the side-by-side photo that Drew posted, I'm guessing the spring seat of the drum piston is 0.150 inch deeper into the valve body than the spring seat of the disc piston. 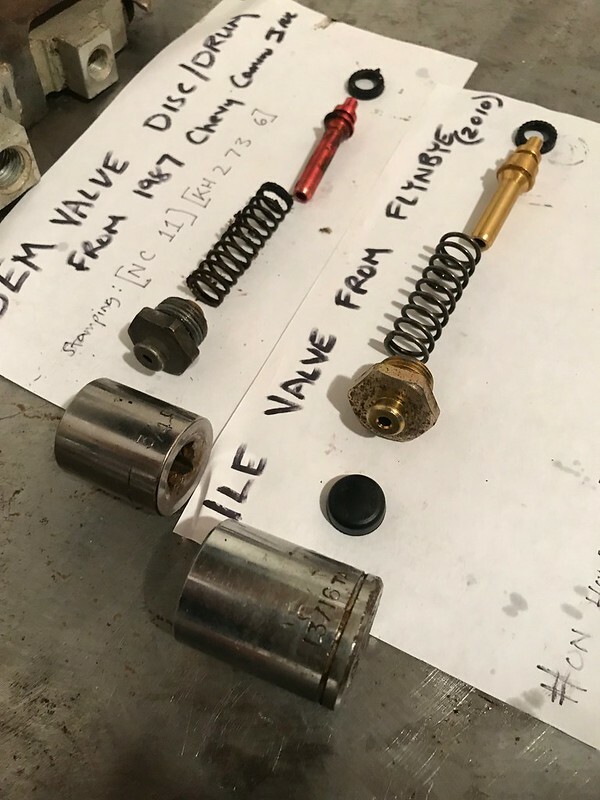 That means you can install the same spring onto both pistons and get different spring force when assembled, and that will change the valve knee point on the pressure curve. In other words, there could be a lot of combinations available using just stock parts. So I set up a spreadsheet that calculates the spring force on the plunger when assembled. I just need to refine it based on the measurements of the pistons that I asked for. Once I get that info then I think we're in business, boys! People focus only on spring rates in all the threads I've seen about the "spring mod". But I don't think that is the key characteristic that determines how the prop valve works. The key characteristic is the spring force on the plunger, as assembled. Bottom line is you've got to know how far the spring is compressed. The differences in spring free-length, and the spring seat position on the piston (disc vs. drum pistons) needs to be taken into account. For example, using a disc plunger vs. a drum plunger might change the force by 40%. That's HUGE! Installing a longer drum spring in a disc valve might increase the force by 40% too. 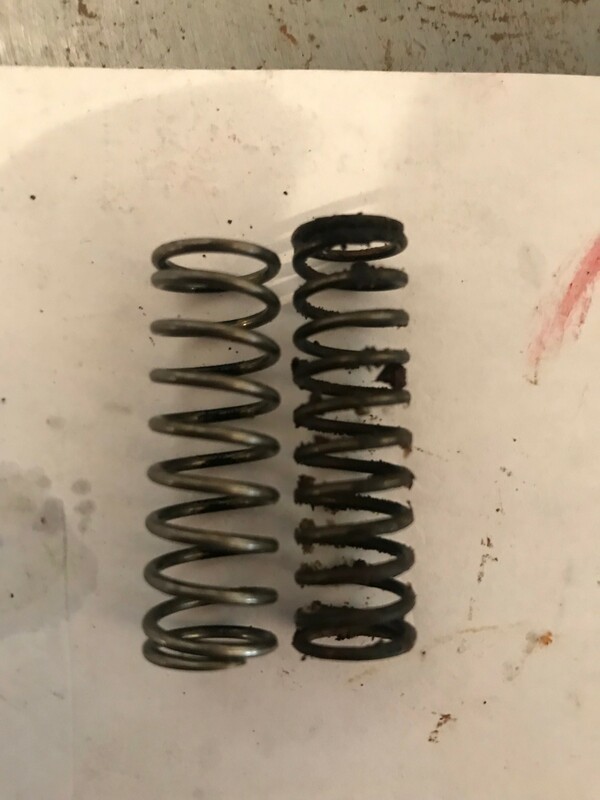 I think this explains why there are so many different reports from people about how their brakes work when they swap springs; and why one guy gets away with a 20 pound spring and another guy needs a 30 pound spring. I think things are going to come in to focus if you guys can help with with the measurements I requested. Last edited by QwkTrip; 02-19-2019 at 02:10 AM. Hmmm.... it seems I don't have things figured out yet. Apparently the diameter of the piston effects the proportioning ratio and there are multiple size pistons made. That's why Drew has a red piston and I have a different color piston. The color signifies the diameter. Going to have to study this more. I think this explains why there are so many different reports from people about how their brakes work when they swap springs; and why one guy gets away with a 20 pound spring and another guy needs a 30 pound spring. I think things are going to come in to focus if you guys can help with with the measurements I requested. I think it is also subjective. One person may be happy applying a harder pedal force than another and vice versa. I'd have to find the prop valve, and tear it down to check. Pics I posted are from awhile back as I was refurbing bits for the green car. I've been boxing parts up as I go and tucking them away on the shelf until I need them, so I'm not entirely sure where my spare PBR prop valve is at the moment. Alright, I've got a better understanding of this now. The actual proportioning ratio (the percent reduction of rear line pressure) is based on the dimensions of the piston, specifically the diameter of the spring rod. The spring delays proportioning until the line pressure is high enough to overcome the spring. There are multiple sizes of spring rods and changing those out is how you change the proportioning ratio. Changing the spring out will only change the "cracking" point of the valve where it begins to proportion the rear brakes. The valve doesn't work at all like I had imagined. Whoever came up with the idea was a genius. The piston has a cup-shaped seal that is kind of loosey-goosey, doesn't fit tight to the shaft. That's on purpose. The spring pushes the piston against the cup-seal and causes it to deform such that it loses ability to make a seal. That allows fluid to pass thru freely, and the rear brakes will have full line pressure (same as front). The rear line pressure will walk up at a 1:1 ratio with the front until a point where the pressure overcomes the spring. The shape of the piston is designed so that the rear line fluid pressure pushes the piston against the spring. The piston moves and pulls the cup-shaped seal back into shape, and the seal makes good contact again and stops the flow of fluid. Up until this point the rear lines were at the same line pressure as the front. Not any more. The spring has been overcome and now any increase in rear line pressure will be at a certain percentage of the front line pressure. And that percentage is dictated by the dimensions of the piston rod. The pressure in the inlet chamber + the spring force, pushes the piston one way, and the pressure in the rear lines pushes the piston back the other way. The piston seeks equilibrium where the forces balance. The trick is that the piston is shaped in such a way that the inlet side gets just a little bit of surface area to act on to produce a force (plus the spring force), and the rear line gets a much larger surface area to act on to produce an equal and opposite force. (Force) = (Pressure) * (Area), so the rear line ends up being at a lower pressure than the front when the forces are balanced. That's how the proportioning works. I think the pistons are identified by color. Pistons with a smaller diameter spring rod will cause the rear line pressure to be a higher percentage of the front. This is the slope of the proportioning curve. Increasing the slope (percentage) keeps the brakes feeling the same during normal driving but puts the curve on a trajectory to much higher pressures when the brakes are pushed hard. Valves with a higher spring rate will increase the line pressure when proportioning begins to happen. But the slope (percent of proportioning) will not change. Basically the spring is increasing the Y-intercept of the curve, but not changing the shape. It doesn't help much when slamming on the brakes, but does make the brakes more aggressive when driving easy. For example, increasing the spring by 40% might only result in another 30 psi rear line pressure, but changing piston rods might get you another 100 psi rear line pressure. If you only remember one thing from this then remember this: Swapping pistons is the best way to increase effectiveness of rear brakes. Last edited by QwkTrip; 02-19-2019 at 09:09 PM. I've got a spreadsheet that spits out prop curves for our OE valves, using any spring and piston. I'd really really really really like to know these dimensions for the "red" piston. PRETTY PLEASE WITH SUGAR ON TOP! I just made up these terms for lack of better knowledge. Water? Like out of the toilet? The operative diameters are the same. Great stuff. Simplest explanation is usually the correct one. Will read again in morning when head is clear. Yep, the '90-92 LF red piston produces more rear pressure than the '86-89 NB piston, even though the springs are the same. Now we're starting to get a better idea what makes the later 1LE work better. Now you want to sell that to me so you don't have to lose it all over again? are you referring to J65 or 1LE? It’s my understanding that 1LE includes bigger 2 piston brakes up front and that is yet another, different combo valve? I went back and looked at my Wilwood graph and figured out the pressure ratio is only 43%. But the spring has a huuuuuge range of adjustment. Not wholly confident my calcs are totally correct, but I'm getting 54% ratio for a stock NB valve, and 65% ratio for a stock LF valve. The stock valves appear to have a more aggressive slope than the Wilwood, but the hysteresis point where the valve cracks is waaaaaaay lower than a Wilwood. Last edited by QwkTrip; 02-20-2019 at 07:49 PM. If you have the time, it would be interesting to know what type of force is required for each type of brake. 1LE up front, single piston up front, J65 in back, drum in back. Basically, the four types that would be found. I imagine that one could figure out the force required for lock-up based on surface area of the brake and speed/weight at each wheel and friction coefficients of tires/pads. if you know the answer to this for each brake type, then it may give insight to what the requirements of the prop valve need to be. i.e. if rear drums require less force to create brake lockup than a J65 caliper you can then translate that to what is required from the prop valve/spring setup. It would also give you a sanity check on your calculations to see if they are correlate. No can do, bro-migo. Original take off from my Formula, so I'm married to it. LOL I had to replace the original prop valve because of an aftermarket cast iron master cylinder that filled the valve with sludge. 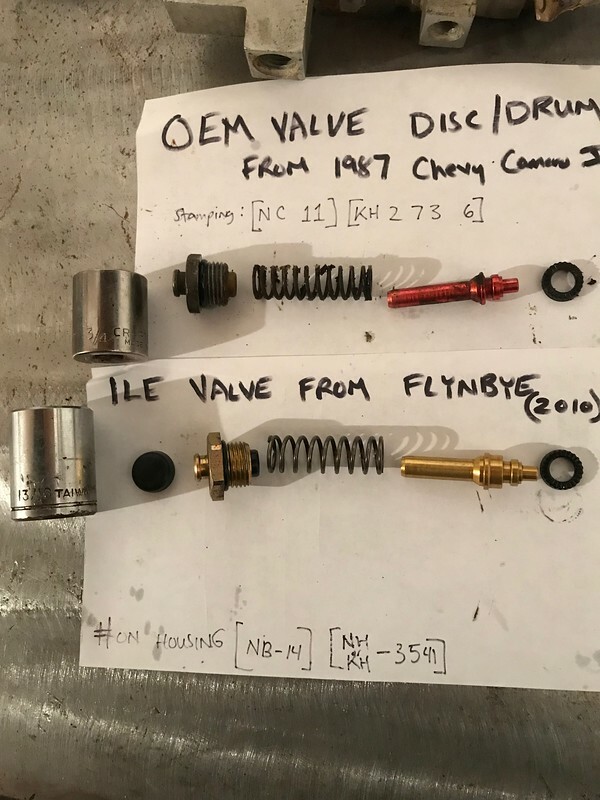 Fortunately I was able to pick up a NOS valve from Flynbye about a dozen years ago. The original LF internals will probably end up in the green Firebird, since the brake system I've set aside is all new 1LE junk. They're the same thing. The only part of the valve that's different is drum/disc. The front half of the circuit is the same regardless of 1LE or J65. you are correct about your count of the number of coils. my mistake! Last edited by IROCZman15; 02-20-2019 at 08:00 PM. Thanks now a bunch more questions: J65 -vs- Drum. Is the only difference the plunger and the spring? 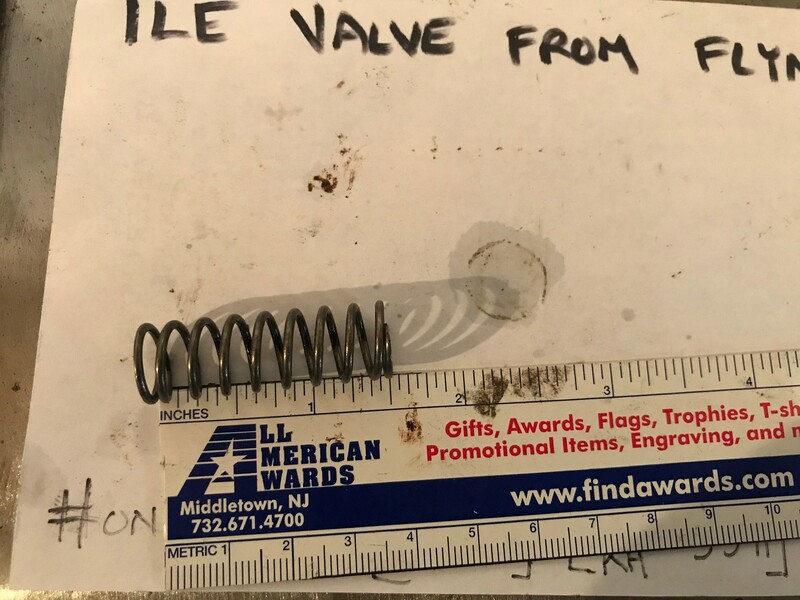 Valve body identical? How do we know what is inside these valve bodies anyway? I'm assuming it is simply a tunnel for brake fluid to run thru, but do we know with out a doubt diameters and lengths of these tunnels are the same? And one other question, does the front brake have a plunger/spring system similar to rear? It looks different?? Last edited by IROCZman15; 02-22-2019 at 11:49 PM. Well folks, I've concluded I have to stay with the Wilwood valve that's on my car. My rear brakes are just too wimpy and need more line pressure than any modified 3rd gen prop valve can deliver. Absolutely could not have figured this out without your help! Thank you for all the measurements and data points! My Formula was a regular (not daily) driver back in the day.... Back in Houston, back in her hey day when the freeways had not yet reached 24 lanes. Hang with me now.... Back then, it was a regular occurrence to go from 90mph to 0 in short order. Other option was accident and tow. i can tell you, back then, the Formula was fully capable of braking from 90 to 0 in VERY SHORT order. No ABS, JUST good old fashioned slamming the brake pedal to to floor and correcting the steering for tail spin. What I am trying to say, is the brakes preformed magnificently. Now if you want to compare them to your modern day Toyota XXXXX well, its not a proper comparison. These are old school race car brakes, plain and simple. cheap but they work. The reason I say this is because I'm somewhat mystified by people saying the braking systems in these cars are no good. for 1990, they were pretty damn good. We're not talking expensive European cars here. Anyway, my 3 cents, thought I'd toss that out. food for thought. Ya, the brake bias is actually pretty good in these cars. But the brakes heat up real fast! The big brake craze is kind of goofy too though. People are spending gobs and gobs of money to put really large & heavy brakes on their cars and making their cars slower when they don't have to. A good 12" brake will stop faster than a 14" brake as long as both are managing the heat. There's no need to be hauling the extra inertia of the 14" brake if you don't have to. And there's only so much braking torque you can use.... you can have too much brake! Last edited by QwkTrip; 02-25-2019 at 12:06 AM. Of course fast forward to 2019 and if you are driving your thirdgen down the freeway in an emergency braking situation, 149 feet may no longer do the trick like it once did. Adjustable prop valve install questions, using stock combo valve. Throttle bracket for a Q-jet/700R4 combo...what year thirdgen for this combo?